I love my (home) PC. You either love or hate yours. So, which is it? Are you willing to post a photo? We are deep into geekdom with this one. Mine is a direct descendent from a 386 I bought off of my GIS Prof. I had 8 megs of Ram back when that was impressive. The only original 386 part left is the 3.5” drive. It is currently a P2-300mhz. It has been Frankensteined and upgraded since 1993. It is on its fifth motherboard and fourth video card. I have less than $600 over its lifetime in it. It is only a little slower than the 1 ghz p3 at work. If you look close you can see actual duct tape. THAT is a case, Guap! I need to buy a digital camera. The computer at home is a homebrew. I'll edit this message later to add more stats, like the motherboard and video cards, but now I'll just gloss over the essentials. 1.2 gig AMD Athlon Thunderbird, stock/not OCed. 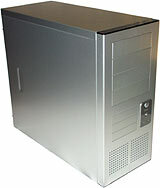 Lian Li PC-60 aluminum case -- it's cooooool, literally. Northgate Omnikey or IBM Type M, whatever I'm in the mood for that day. Windows XP Pro. I'll eventually partition a chunk of drive space, and dual boot with Mandrake Linux 8. I need to get a GeForce 3. I have a Matrox Millennium 400 video card, which produces wonderfully crisp, sharp, accurate 2D images, but is lacking when it comes to the 3D skillz. I do have a second Lian Li PC60 case that I'm trying to get rid of. Unopened carton, straight from the distributor. $140 + shipping and it's yours. Work - Gateway, 1.3 GHz Pentium 4, 128 RAM, 19" monitor, 40 Meg hard drive, CD-ROM and re-writable, fire wire, Windows 2000 Professional. Home - Gateway, 1.8 GHz Pentium 4, 256 RAM, 19" monitor, 40 Meg hard drive, DVD-ROM and re-writable, fireware, Windows XP Professional. Things have come a long way from the Apple IIe I used to work on in high school. This is shocking to many because my peripheral duties to being a planner have included network maintenance, GIS, CAD, and website design for the past 6+ years. I do own an abacus though. I should have it back up and running in a few weeks...one of my soon-to-be in-laws (a bona-fide geek who watches TechTV all the time) has the CPU and is "tweaking" it for me with a new hard drive and other toys. A couple of weeks ago I was able to pick up a really nice slide rule with a leather case for just a buck. Michael, What size batteries do you have to get to run a slide rule? Batteries? That's the beauty of it. In the aftermath of the coming nuclear apocalypse, when all of you electronic marvels are worthless junk, the remains of society will turn to those who can use a slide rule to rebuild their shattered cities... Now how do I calculate a half-life? I am currently a computer parasite. That is to say that I use whatever computer is available, be it one of the school's, a friend's, my employer's (both past and current), or what have you. This, I intend to remedy as soon as my finances have been ironed into a somewhat prone position. In the meantime, I shall continue to feed. AMD Athlon 1500xp clocked at 1 Ghz because i have crappy memory and every time i clock it up to full speed the computer crashes. 256mb of PC100 and PC133 memory. 17' trinitron monitor .23 dotpitch woo! just up until recently, the computer has in the orignial case i got back in 1996 for a 286, i had to use tin snips to make the case fit a atx motherboard, and atx powersupply. There was about 3 fans on the computer, the top of the case didn't fit anymore, etc. but now i just upgraded to a atx mid-tower.